Import service center has the answer! If your check engine light is on, your vehicle is trying to tell you that there is a problem! The problem could be something as simple as a loose gas cap, or it could indicate that your vehicle needs a major repair. Either way, ignoring a check engine light will ultimately be harmful for your engine. As soon as you notice that one of your dashboard lights has come on, schedule service at Import Service Center as soon as possible. 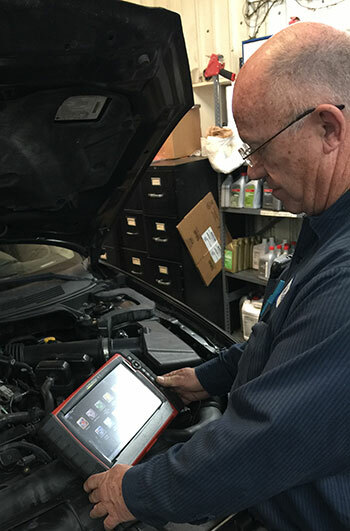 Our team of experts has the diagnostic tools and state-of-the-art equipment needed to determine the problem and find the best solution. The gas cap maintains pressure within your vehicle’s fuel tank by sealing the fuel system. When your check engine light comes on, it could mean that your gas cap is either too loose, cracked or damaged. Why should you have this inspected? Not fixing this problem could increase emissions because fuel will be lost through evaporation. It also reduces gas mileage. The mass airflow sensor measures the amount of air entering the engine and notifies the car’s computer to add the proper amount of fuel. A faulty sensor will reduce your vehicle’s performance and gas mileage. More importantly, it could damage spark plugs,the catalytic converter or oxygen sensor. Your oxygen sensor monitors the unburned oxygen from the exhaust and monitors how much fuel is burned. This is something that needs to be fixed as soon as possible. A faulty sensor not only reduces gas mileage, but also increases emissions by causing the engine to burn more fuel than necessary. Your catalytic converter reduces exhaust by converting carbon monoxide into carbon dioxide. Typically, catalytic converters fail when the vehicle isn’t regularly maintenanced. If your catalytic converter is failing, your vehicle’s gas mileage will decrease dramatically and the car may not increase in speed when you hit the gas pedal. Additionally, your vehicle won’t be able to pass an emissions test without it. Spark plugs seal the combustion chamber and ignite the mixture of air and fuel in the combustion chamber. When spark plugs misfire, you will feel a jolt in your vehicle’s acceleration. These are a simple fix that can be taken care of quickly. Otherwise, your car’s performance, power and fuel economy will suffer. Worn plugs or plug wires can also cause damage to the catalytic converter and oxygen sensor.